Through the exhibit “Faith in Color: A Photographic Exploration of Race, Religion, and America in Tribute to C. Eric Lincoln,” a Duke senior aims to change people’s perceptions. The exhibit is on display in the Duke University Chapel until May 1. Evan Nicole Bell is from Columbia, Maryland, a planned community founded by Jim Rouse. She says Rouse’s vision to eliminate class and race division is what shaped her growing up. Bell got into photography during high school; after 10 years of ballet, she was searching for a new creative outlet. 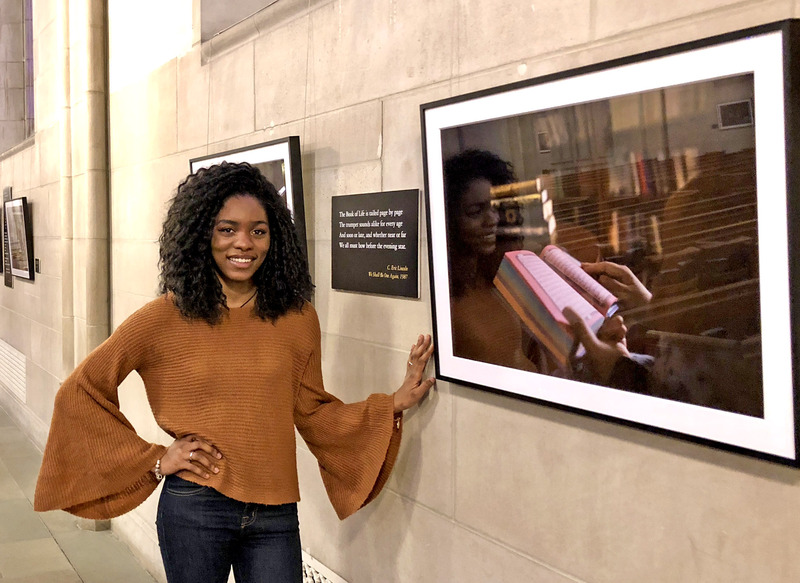 She started out shooting food in her AP photography class but when she got to Duke she realized she could combine photography and social justice in an academic discipline: documentary studies. This mantra is visible in “The Resistance Project” where Bell uses photography to resist stereotyping and racism on Duke’s campus. It’s important to Bell to understand the history of documentary for two reasons: to not repeat the mistakes of the past and to understand the weight of what you’re doing. She goes for capturing humanity in her documentary work, as opposed to shooting photos that draw pity from viewers. “When we don’t see each other as human, that’s when we get mass genocide, that’s when we get things like the Holocaust,” Bell said. Alex Harris, Bell’s instructor, shares the same sentiment and praised her work. “Photographs are by definition about the surface of things. Evan manages to hint at qualities of the interior lives of people she photographs,” Harris said. Bell runs a non-profit called Project InTouch which provides free transportation for kids to visit their incarcerated parents as well as providing them support. Bell started the project in high school after finding out one of her friends had an incarcerated father. She was disturbed by the traumatic effects the arrest had on her friend as well as the fact her friend’s father was jailed hundreds of miles away. Project InTouch opened the opportunity to meet with Madison Strempek, a child author with an incarcerated father. This would result in the work “No Longer Invisible: A Conversation with Madison Strempek” which sheds light on the underrepresented narrative of children with incarcerated parents. “We don’t typically get to understand mass incarceration or criminal justice issues from the perspective of the dependents who are affected by it,” Bell said. The space where the exhibit is held affects the way Bell orders photos. Documentary is a story and in order to tell it properly to viewers, she has to consider how people enter and walk through the exhibit space. Bell cites her mom as someone who takes on the more administrative requirements of her work by helping out with not only research but managing financials. Bell also describes her mother as an artistic person who challenges her to try new things. “She’s definitely a blessing,” Bell says. The current exhibit is titled “Faith in Color” as play on the people in the images being black or of color and the factor color plays in the exhibit. When putting the exhibit together, Bell says she knew she wanted photos of St. Titus Episcopal church, near NCCU’s campus. She remarked it as culturally and historically important to black religion specifically in Durham. The exhibit is mixed media, pairing two of Bell’s photos with an excerpt from C. Eric Lincoln’s poetry. Lincoln was a professor of Religion and Culture at Duke University from 1976–1993 and wrote about race and religion. Alex Harris credits Bell as the sole curator of the exhibit and says he only advised her to draw connections between the photos. “When Evan showed me her photographs of faith-based photographs for “Faith in Color,” it struck me that she had not limited her documentation of faith to religious services. She also showed me a number of photographs she intended to include in the exhibit that show everyday moments in the lives of African-Americans in the Triangle,” Harris said. “Faith in Color: A Photographic Exploration of Race, Religion, and America in Tribute to C. Eric Lincoln” will be in the Duke University Chapel until May 1. For more information on Evan Nicole Bell and her work visit evannicolebell.com and her LinkedIn page.